Teaching machines were originally mechanical devices. They presented educational materials and taught students. They were first invented by Sidney L. Pressey in the mid-1920s. His machine originally administered multiple-choice questions. The machine could be set so it moved on only when the student got the right answer. Tests showed that learning had taken place. This was an example of how knowledge of results causes learning. Much later, Norman Crowder developed the Pressey idea further. B.F. Skinner was responsible for a different type of machine called GLIDER, which used his ideas on how learning should be directed with positive reinforcement. Skinner advocated the use of teaching machines for a broad range of students (e.g., preschool aged to adult) and instructional purposes (e.g., reading and music). 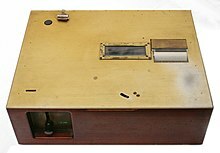 The instructional potential of the teaching machine stemmed from several factors: it provided automatic, immediate and regular reinforcement without the use of aversive control; the material presented was coherent, yet varied and novel; the pace of learning could be adjusted to suit the individual. As a result, students were interested, attentive, and learned efficiently by producing the desired behavior, "learning by doing". There is extensive experience that both methods worked well, and so did programmed learning in other forms, such as books. The ideas of teaching machines and programmed learning provided the basis for later ideas such as open learning and computer-assisted instruction. Illustrations of early teaching machines can be found in the main sourcebook. Edward L. Thorndike in 1912: "If, by a miracle of mechanical ingenuity, a book could be so arranged that only to him who had done what was directed on page one would page two become visible, and so on, much that now requires personal instruction could be managed by print". Pressey in 1932: "Education was the one major activity in this country which has thus far not systematically applied ingenuity to the solution of its problems". (p. 668). He thought the machine he developed would lead to an "industrial revolution in education" (p. 672). ^ Pressey's priority is supported by Ernest Hilgard in Hilgard E.R. 1966. Learning & the technology of instruction. Chapter 16 in Hilgard E.R. & Bower G.H. 1966. Theories of learning. 3rd ed, New York: Appleton-Century-Crofts, p554–561 Programmed learning. ^ Pressey S.L. 1926. A simple apparatus which gives tests and scores – and teaches. School and Society, 23 (586), 373–376. ^ Pressey S.L. 1927. A machine for automatic teaching of drill material. School and Society, 25 (645), 549–552. ^ a b Pressey S.L. 1932. A third and fourth contribution toward the coming "industrial revolution" in education. School and Society, 36 (934), 668–672. ^ Pressey 1950. Development and appraisal of devices providing immediate automatic scoring of objective tests and concomitant self instruction. Journal of Psychology, 29, 417–447. ^ Crowder N. 1959. Automatic tutoring by means of intrinsic programming. In Galanter E.H. (ed) Automatic teaching: the state of the art. New York: Wiley, 109–116. ^ Crowder Norman A. 1960. Automatic tutoring by intrinsic programming. In Lumsdaine A.A & Glaser R. (eds) 1960. Teaching machines and programed learning I: a source book. Washington D.C. National Education Association of the United States. ^ Skinner B.F. 1965. The technology of teaching. Appleton-Century-Croft. Includes reprints of all his papers on programmed learning. ^ Skinner B.F. and Holland J. 1961. The analysis of behavior: a program for self instruction. p.387. ^ Glaser R. (ed) 1965. Teaching machines and programed learning II: data and directions. Washington D.C. National Education Association. ^ Lumsdaine A.A & Glaser R. (eds) 1960. Teaching machines and programed learning I: a source book. Washington D.C. National Education Association of the United States. ^ Thorndike E.L. 1912. Education: a first book. New York: Macmillan, p165. This page was last edited on 19 January 2017, at 05:29 (UTC).